PT Permodalan Nasional Madani (Persero) - PNM or known as PT PNM (Persero) is a well-known state-owned financial services company in Indonesia. PNM has strong business competencies in business development of Micro and Small Enterprises. PNM engaged in providing financing and assistance of SME business. Its business include financing services, management services and the capacity building program, and venture capital financing services. PNM was formed in 1999 by the Government of Indonesia under the Government Regulation No 38 of 1999 dated 29 May 1999. After 18 years of operation, PNM now has 63 branch office, 631 ULaMM offices, 1,251 Mekaar Offices spread across Indonesia (as of December 2017). PNM also supported by 5 subsidiary companies (including shares in 3 BPRS), 8 sub-subsidiary companies, and 5 affiliate companies. According to information found in PT Permodalan Nasional Madani (Persero) Annual Report 2017 as cited by JobsCDC.com, PNM managed to record total revenue of Rp 2,235.22 billion in the business year of 2017. This number is up 57.39% as compared with total revenue booked in 2016 amounted to Rp 1,420.42 billion. Total asset in 2017 up 46.90% to Rp 11,393.58 billion from Rp 7,755.62 billion in 2016. Female, age around 18 - 22 years old. Minimum SMA/SMK in any field (AO), Accounting, Office Administration, Banking and SMA IPS (FAO). Able to ride a motor cycle. PNM Cabang Magelang - Ruko Metro Square Blok B 18 No 19, Jl Mayjend Bambang Sugeng Mertoyudan Magelang. JobsCDC.com now available on android device. Download now on Google Play here. Please be aware of recruitment fraud. The entire stage of this selection process is free of charge. 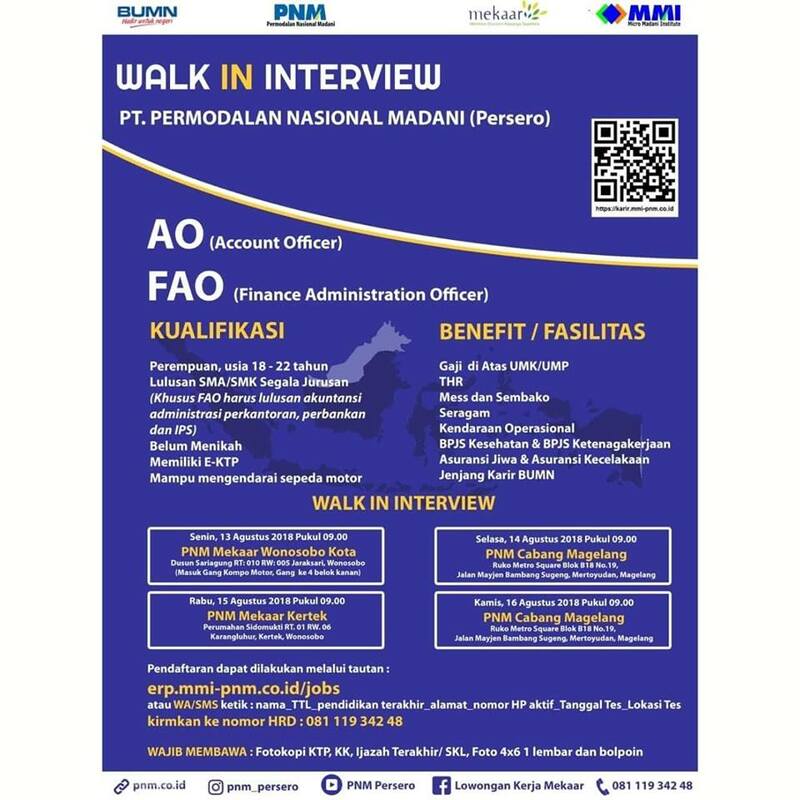 PT Permodalan Nasional Madani (Persero) - SMA, SMK AO, FAO PNM August 2018 will never ask for fees or upfront payments for any purposes during the recruitment process such as transportation and accommodation.